← How Much Indian Do I Have In Me??? Finally, an answer, after almost 20 years and very nearly losing the opportunity of ever knowing. Today, in Nature, a team of scientists released information about the full genomic sequencing of Kennewick Man who was discovered in 1996 in Washington state. Previous DNA sequencing attempts had failed, and 8000 year old Kennewick Man was then embroiled in years of legal battles. Ironically, the only reason DNA testing was allowed is because, based on cranial morphology it was determined that he was likely more closely associated with Asian people or the Auni that the Native American population, and therefore NAGPRA did not apply. However, subsequent DNA testing has removed all question about Kennewick Man’s history. He truly is the Ancient One. Kennewick man is Native American. His Y haplogroup is Q-M3 and his mitochondrial DNA is X2a – both unquestionably found in the Native American aboriginal population. His autosomal DNA was analyzed as well, and compared to some current tribes, where available. We find that Kennewick Man is closer to modern Native Americans than to any other population worldwide. Among the Native American groups for whom genome-wide data are available for comparison, several seem to be descended from a population closely related to that of Kennewick Man, including the Confederated Tribes of the Colville Reservation (Colville), one of the five tribes claiming Kennewick Man. We revisit the cranial analyses and find that, as opposed to genomic-wide comparisons, it is not possible on that basis to affiliate Kennewick Man to specific contemporary groups. We therefore conclude based on genetic comparisons that Kennewick Man shows continuity with Native North Americans over at least the last eight millennia. Interestingly enough, the Colville Tribe, located near where Kennewick Man was found, decided to participate in the testing by submitting DNA for comparison. 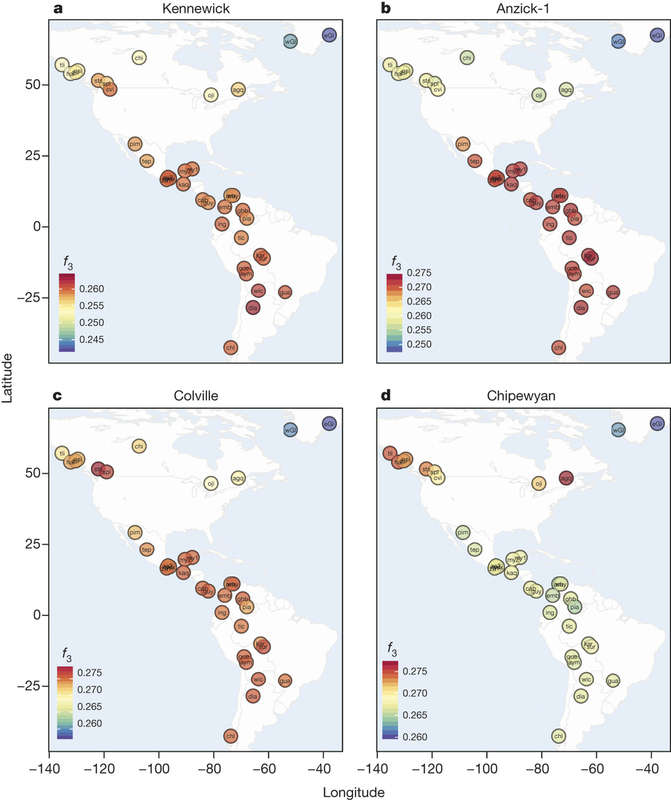 Our results are in agreement with a basal divergence of Northern and Central/Southern Native American lineages as suggested from the analysis of the Anzick-1 genome12. However, the genetic affinities of Kennewick Man reveal additional complexity in the population history of the Northern lineage. The finding that Kennewick is more closely related to Southern than many Northern Native Americans (Extended Data Fig. 4) suggests the presence of an additional Northern lineage that diverged from the common ancestral population of Anzick-1 and Southern Native Americans (Fig. 3). This branch would include both Colville and other tribes of the Pacific Northwest such as the Stswecem’c, who also appear symmetric to Kennewick with Southern Native Americans (Extended Data Fig. 4). We also find evidence for additional gene flow into the Pacific Northwest related to Asian populations (Extended Data Fig. 5), which is likely to post-date Kennewick Man. We note that this gene flow could originate from within the Americas, for example in association with the migration of paleo-Eskimos or Inuit ancestors within the past 5 thousand years25, or the gene flow could be post colonial19. The authors go on to say that Kennewick Man is significiantly different than Anzick Child, which matches closely with many Meso and South American samples. Kennewick on the other hand, is closely related to the Chippewa and Anzick was not. This divergence may suggest a population substructure and migration path within the Americas, although I would think significantly more testing of Native people would be in order before a migration path would be able to be determined or even suggested. It is very interesting that Anzick from Montana, 12,500 years ago, would match Meso American samples so closely. I would have expected Kennewick to perhaps match Meso Americans more closely because I would have expected the migration pathway to be down the coastline. Perhaps that migration had already happened by the time Kennewick man came onto the scene some 8000 years ago. You can read the entire paper at this link. This entry was posted in Anthropology, Anzick, Chippewa, Colville, DNA, Kennewick Man. Bookmark the permalink.